Looking for something savoury this Christmas? 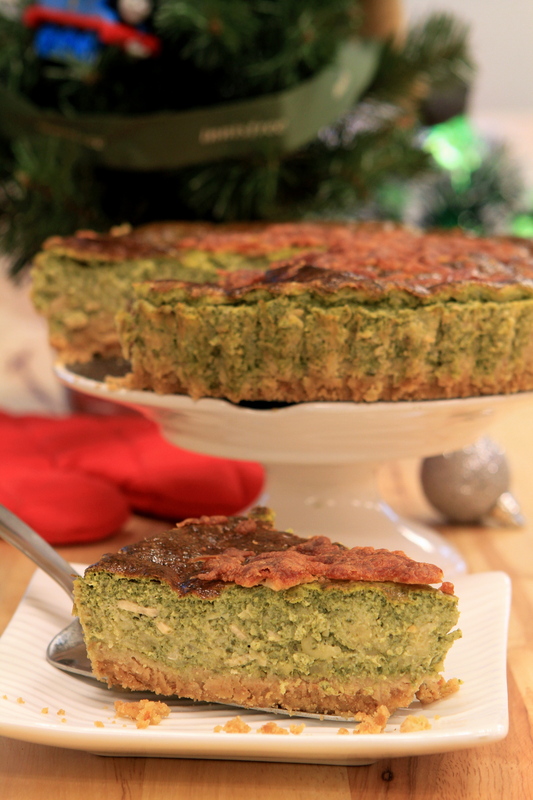 This quiche can be served hot or cold. Crush the biscuits and mix it with butter. Then pour it on the loose bottom pie pan and spread the mixture onto the pan. Let it rest while you prepare the rest. Clean and boil the spinach for 5 minutes. Drain and let it rest at room temperature. The blend the spinach. Chopped the garlic and heat the pan with olive oil. Sauté garlic with chicken ham for 5 minutes. If you're a fan of mushrooms, sauté them together. Once done, drain the olive oil, put the ham mixture aside to cool at room temperature. Add eggs and milk together. Stir, then add in black pepper, salt and nutmeg. Then add in the cheeses ( leave some for the topping),blended spinach and the sautéed garlic with the ham. Pour the whole mixture into the pie pan with the crust and sprinkle leftover cheese on top. Preheat the at 180 degrees Celcius before you bake. Bake for 45 minutes. Remove and serve.